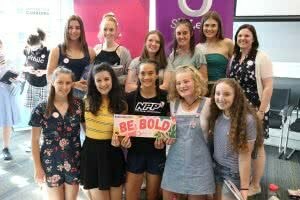 The 2018 She Leads High Conference was a one-day leadership event for young women, including female identifying and non-binary people, in years nine and ten. 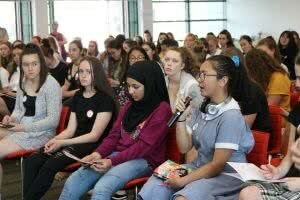 The event engaged young women with concepts of leadership, confidence, developing positive relationships, and provided a safe space to discuss school, careers, body image, language, sexuality and gender. 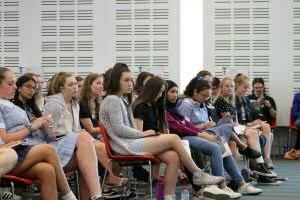 On Thursday 1 November, a record-breaking 118 young female identifying people attended the She Leads High Conference at the University of Canberra’s Ann Harding Conference Centre. The students attended from eleven different high schools in Canberra alongside two rural schools from outside of the region. 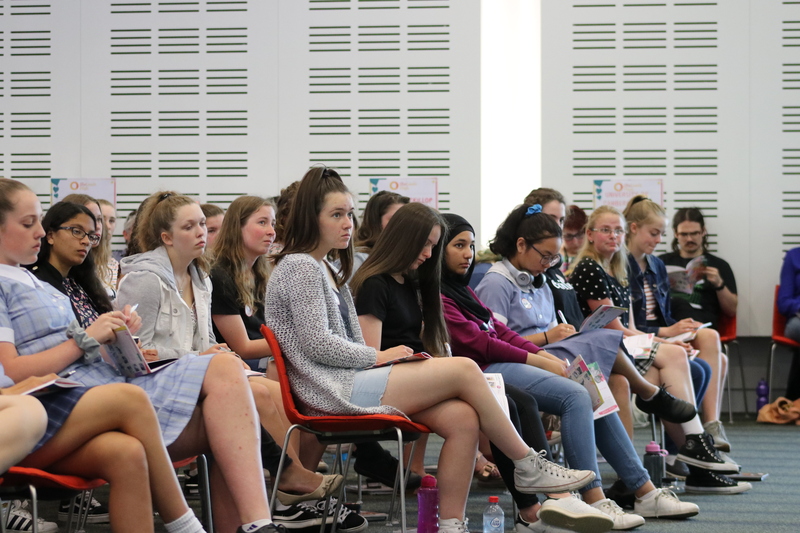 The She Leads High Conference helped the young women to gain an understanding of the fundamentals of leadership, the varying types of leaders in society and how to begin their leadership journey in their own homes, schools, friendship groups, and communities. The day started off with an inspiring Welcome to Country by Ngunnawal Elder Aunty Violet. Aunty Violet encouraged the young women to not be pressured by others and to follow their own path in life. 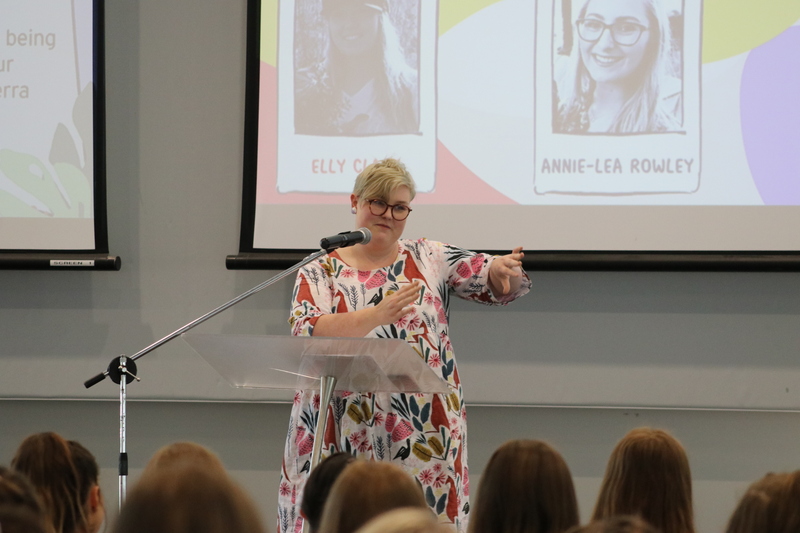 Aunty Violet encouraged the conference to think big and remain bold in their future lives, reminding the girls that someone in this room could be the next female Prime Minister of Australia. Laura Campbell, the MC, and created an open judgement-free space for the young women to express themselves. Laura began the day with her vibrant personality and playful comedy style. She encouraged us to throw away the archetype of leadership that the girls had in their head. She reminded the students that the conference was a day for them. A day to have a moment to ask themselves ‘who am I?’ and leave knowing that it is ok to grow at your own pace. 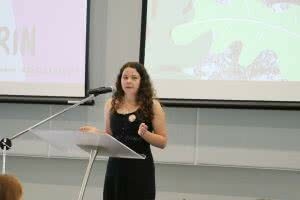 Our first keynote speaker was Dhani Gilbert a proud Wiradjuri woman in year 11 at Dickson College. 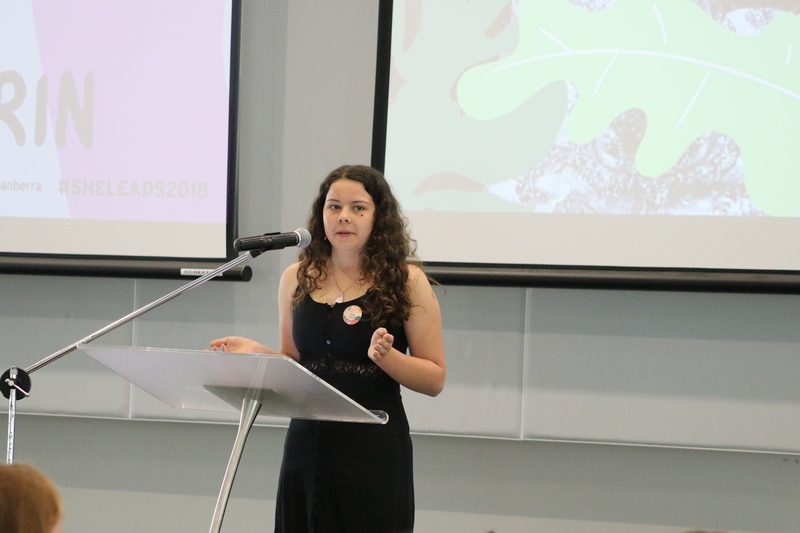 Dhani was awarded Young Canberra Citizen of the Year in 2018 and is passionate about the environment, culture, social justice, community, education and youth participation. Dhani is using her platform to raise awareness. “As young women, we need to support each other because if we don’t no-one else will,” Dhani said. Dhani went on to tell the conference that what everyone adds to the world is unique and no one is the same. She encouraged the girls to start speaking up and using their voices, because if they don’t start speaking, people will speak for them. Dhani highlighted the importance of having a support network and reflected on how women have always been great role models in her family. She talked about how her mob and her family have been some of her most influential teachers. Dhani spoke about her own leadership journey and how being in year 11, she is still figuring it out. Dhani encouraged the girls to continue to participate in events like She Leads High to keep connected. She also urged them to participate in the community in order to shape and be a part of change. We then moved on to our first workshop session of the day. The students were split in half and sent to two different workshops. YWCA Canberra’s Youth Engagement Team, facilitated by Annie-Lea Rowley and Anna Bromilow, hosted the Positive Identities workshop. 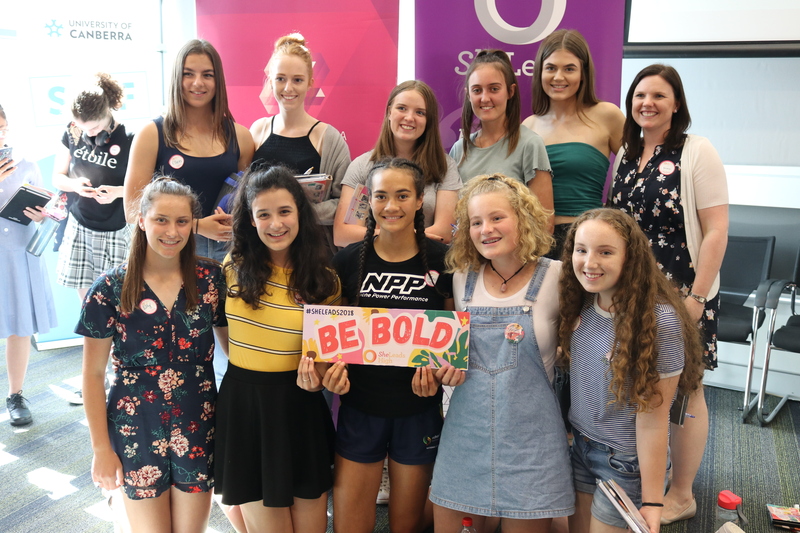 The Positive Identities workshop exposed the students to a variety of topics including respectful relationships, positive and affirmative identities, recognising and overcoming peer pressure and body positivity in a fun and safe environment. The second workshop, Being Bold But Not Alone, was run by the Defence Force Recruiting, hosted by P.O Alee Scarfone and FLT.LT Esther Suh. The workshop pushed the girls outside of their comfort zone and helped them find their inner leader, negotiator and critical thinker through a range of activities. When talking to the girls about the importance of leadership for women, Alee reminded the young women to “Always support your peers and to never put them down. That’s why we have events like this. Girls need to support girls”. After a short morning tea, it was time for our next keynote speaker Taylor Perrin, the 2018 National Women in Construction Tradeswomen Awardee. Taylor began by talking about her leadership journey and how she didn’t think there was a place in leadership for a girl like her. Taylor spoke about the leadership skills and strategies she has learned in order to tackle the challenges and barriers she has faced in a male-dominated industry. Taylor encouraged the students to explore careers in construction and spoke about all the different types of leadership. “Being a leader isn’t about being in charge. It’s about helping make change” Taylor gave the students great advice on the real reason behind being a leader. During question time Taylor was asked how she became so confident on her leadership journey, especially when she was trying to find her way in a heavily male-dominated industry. “If you practice confidence, be who you truly are and don’t care what others think now, you’ll never have to worry about being confident ever again” Taylor encouraged the students to start practising confidence now so that it will help them be bold in their future. After the second keynote speaker the young women began a speed networking session with nine inspiring female leaders under 25. The students were able to talk to the networking speakers and gain valuable leadership and life advice. They were able to talk about leadership, feminism, what their goals and dreams are, and the amazing things they want to achieve in their lives. After a delicious lunch break supplied by the University of Canberra, the students began the second workshop of the day. By now the girls had become comfortable around each other and their inner leaders were visibly shining. Both of the workshop sessions were buzzing with discussions and conversations surrounding Positive Identities and Being Bold But Not Alone. To end an inspirational day, our MC Laura provided her final wrap-up and closing remarks. Laura discussed with the students how their perceptions of leadership had changed, what they had learnt about leadership and themselves, as well as what their overall impressions of the day were. “She Leads High has helped me to realise that other’s opinions shouldn’t dictate my choices. If I just be myself others can learn to respect and love who I am’”. We are very grateful for our Principal Partner, Defence Force Recruiting, and our scholarship partner, the ACT Government, for helping us to make this event as accessible as possible for young women. We are also thankful for our venue partner, The University of Canberra, for their on-going partnership and venue space. Finally, our printing partner, Prinstant, allowed us to provide our interactive and keepsake activity booklets whilst our She Leads Champion, Lush, provided fantastic products to gift to both students and speakers. Visit our Flickr album to view all of the wonderful photos from the day, or check out our Facebook and Twitter pages, and subscribe to the monthly She Leads Newsletter to receive updates on future events. You can also join as a member to receive discounts on future events and other opportunities. The next She Leads High Conference will be held again next year around November 2019.